Today, there are around 2.6 million African American owned businesses in the U.S., according to Entrepreneur. With the help of Black business podcasts, African Americans are able to gain knowledge and understanding about owning a business and really market their brand. When starting a business, there are many challenges that owners may face, whether it’s figuring out their niche or coming up with the money to fund the business. Podcasts for African American entrepreneurs have become a great platform to support, advertise, and promote their businesses. Keeping the cash flow in the Black community will allow for more economic development and growth. This article will introduce you to six powerful Black podcasts that will help in educating you on the importance of entrepreneurship. Let’s face it, it takes some form of income to, not only run a business, but to live! Financially Clean is a non-profit organization that focuses on getting your money right! They are geared to helping individuals, “Live Financially Clean”. While it’s imperative to get adults on the right track, it’s even more important to teach our youth the significance of developing financial discipline. They offer 12-week workshops to students, typically between the ages of 13-24, using the five key components of C.L.E.A.N. : Credit, Learn to Live Without, Education, Attention to Detail, and No Shame in Your Game. With a 100% graduation rate, students are getting a more in-depth knowledge of how to manage their money. Aside from their workshops, hosts Shaun Lynda and Arlington Forbes, aka Two Black Guys with Good Credit, brings an educational and fun weekly podcast that gives listeners a clear understanding on how to achieve their financial goals. Some topics that have been covered in their podcast include the importance of saving bonds, franchising, and the home buying process. Check them out here… Financially Clean! Black to Business is another podcast devoted to connecting entrepreneurs through promotions and live events. Their mission is to provide dedicated Black entrepreneurs with the resources needed to start and grow their businesses. Through their podcast, the audience will get many beneficial tips and advice. One of their many goals is to provide economic growth and development in the Black community. Listen to entrepreneurs and CEOs who have launched their business from the ground up. Interested in possibly starting your own podcast? Black to Business can assist in helping you build and launch your own platform! Another great podcast helping to shape the Black community is Black Entrepreneur Blueprint. 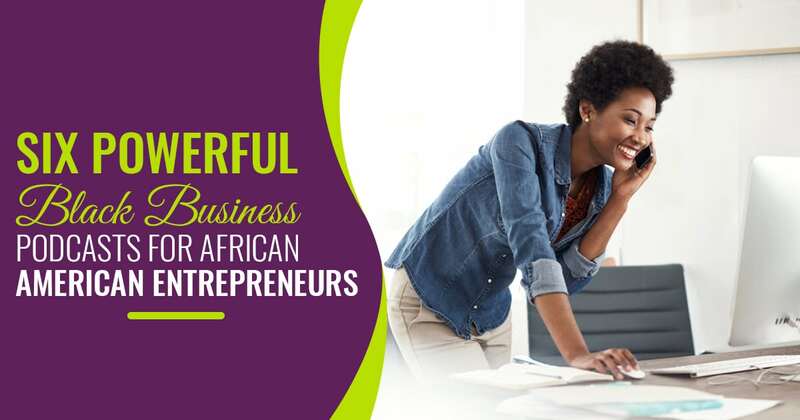 They are dedicated to inspiring Black entrepreneurs to launch, build, and grow successful businesses. The Black Entrepreneur Blueprint podcast gives listeners the opportunity to hear from successful Black entrepreneurs, who share their story and personal experience on how they launched and grew their own business. Hosted by Jay Jones, Black Entrepreneur Blueprint podcast outlines the information needed to become a successful Black entrepreneur in today’s society. Anyone looking for a life coach to help you with your personal or business journey? Dr. Frances Richards not only hosts a podcast, but also offers coaching programs on self-empowerment. Many times, people get so caught up in a routine that society deems necessary to be successful, but Dr. Richards’ coaching can change the perspective. Allowing you to do more of what you love and enjoy, finding your passion, and helping you create a more meaningful life are just a couple key points on her coaching ability. If you are in need of a “pick me up” or you feel like your life is going in a direction that isn’t meant for you, reach out to her! She offers three different coaching packages that can assist you in your life journey. Also, hear from Black entrepreneurs who have found their niche in her podcast! With the intent to significantly increase economics and politics in the Black community, Buy Black Podcast provides free marketing and education for black businesses. Their philosophy is built on Dr. Claud Anderson’s “Powernomics” Theory, which include the five levels of control: Economics, Politics, Justice, Media, and Education. Be a guest on Buy Black Podcast where you will have the opportunity to showcase yourself and your business. Once the show is released, you can post it and share it in order to gain more exposure. Get access to many resources, such as how to register a business or how to support black owned businesses, simply by providing your social media log in information. Go to the Buy Black Podcast and learn more! Money Making Conversations, hosted by Emmy Award-Winning Producer, Rushion McDonald, is also an awesome Black business podcast to check out, as it allows the audience to hear from CEOs, celebrities, and entrepreneurs. Some past guests who have made an appearance on his podcast include Bishop TD Jakes, Charlie Wilson, Deion Sanders, and Morris Chestnut. Mr. McDonald’s weekly podcast allows the audience to hear dynamic interviews that empower and provide the necessary tools to find your passion and live a well-balanced life. He offers many different ways to listen to his podcast, including Sirius XM, iHeart Radio, and Sound Cloud. Need some advice or a private consultation? Contact Rushion McDonald via his website at Money Making Conversations. The Black community has made major strides in entrepreneurship. Allowing the Black dollar to circulate back into the community will provide more wealth in the Black family. Podcasts for African American entrepreneurs are great platforms to gain more knowledge and education. For the individuals contemplating on starting a business or need some direction, I encourage you to listen too! There are endless resources, tips, and interviews, in each of the six Black business podcasts, that will lead you into becoming a successful entrepreneur. Do yourself a favor and check them out! You will not regret it! Each podcast has its own unique style, but they all have one thing in common…to elevate, motivate, and encourage the Black culture.